How can you set the default search provider in the adressbar for Firefox? I'm trying to set the default address bar search engine to Duck Duck Go. The expected functionality should work as such: I type something that is not an address in the address bar, the browser opens a Duck Duck Go results page for whatever I typed. Currently I am being given a Google results page. But this is not doing what I want. I am not talking about the search box (which can have a dropdown to choose different providers, shown here) I am talking about the address bar (which is used to navigate to URLs). I believe that setting was removed by Mozilla. The alternative way is to set the search bar engine to DuckDuckGo and the address bar will also work as needed. In order to change the search engine, navigate to Firefox preferences, click on the Search tab, find Default Search Engine, drop-down the list which might currently be set to Google, and select DuckDuckGo. You can use bookmark keywords to search from the address bar with them (like wr for the Russian Wikipedia etc.). However, to change the default search with no keywords to a custom URL, you need to create a "search plugin". You can do so by following this tutorial or using this site that does it automatically for you. After you create a new plugin, you can set it as your default search engine from the about:preferences#search options page. 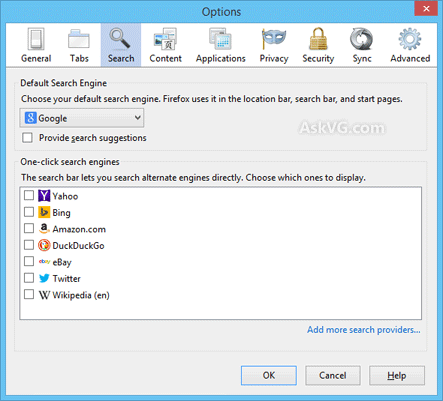 How do I get Firefox to use Bing as the default search provider? Why the other URL is opening instead of the expected URL after clicking on a link received from google search in Firefox? How -exactly- do I change the default address-bar search on Mozilla Firefox? Current method to set Firefox address bar search URL? What is the search engine address for Google?